Ron Sobran created an unequally restyled 1951 Mercury with laid back windshield around 1952 in the Detroit Michigan area. A closer look at this early Full Custom 1951 Mercury. 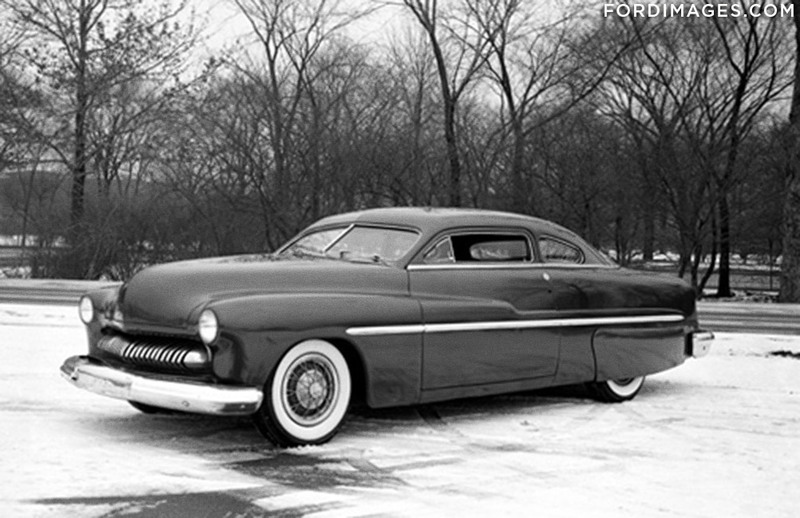 The first time I came across a picture of Ron Sobran’s 1951 Mercury was around 2005. 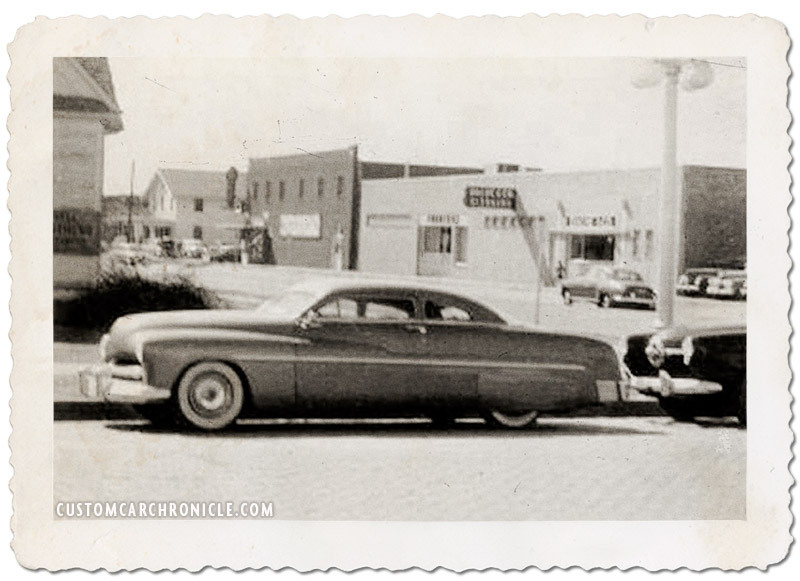 I had found an old, already ended photo auction on eBay of an bit oddly chopped 1951 Mercury parked on a street. The old photo really intrigued me for several reason. One because it was of a full Custom Car parked on the street in an unknown town in the early 1950’s, Two because the car had a very uniquely chopped top. 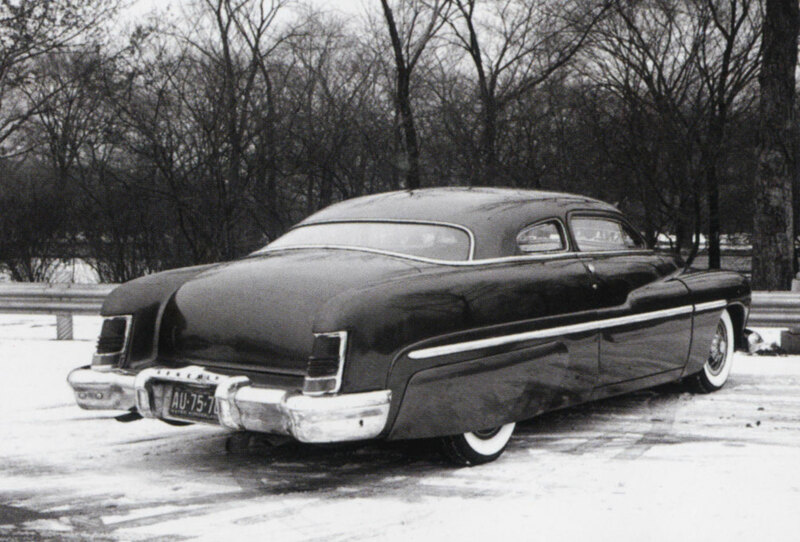 The first photo I ever saw of Ron Sobran’s 1951 Mercury. The Custom looked very interesting with its strangely shaped chopped top, door handles and parked on the street of an unknown town. Possibly the hubcaps on this version were stock ’51 Mercury units? I shared the photo with some of my Custom Car friends from the US, asking if anybody recognized the car, sadly nobody did. It took a few more years before I came across a few more photos of the same Mercury. 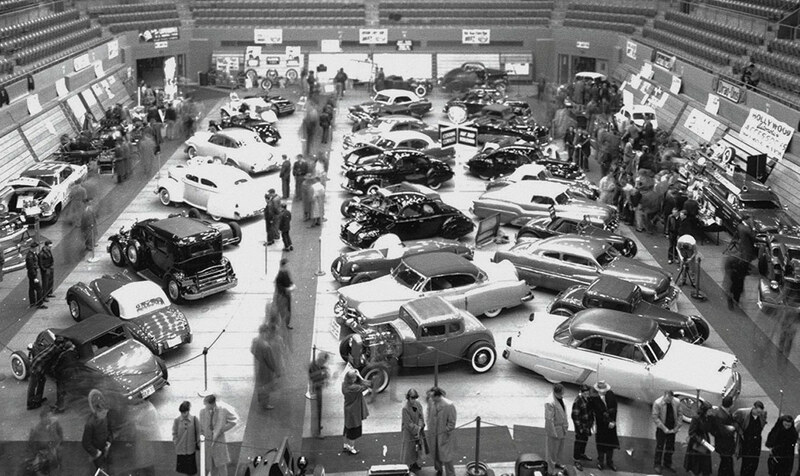 Photos that were taken at the first Annual Detroit, Michigan Autorama in Jan-Feb 1953. These new photos gave me a bit more info on the Mercury, not about the owner or who built it, but more about how it was restyled. The photos showed that the stock Mercury windshield had been laid back, and was not actually cut like we are all known from the more “regular” chopped tops. The new Autorama photos showed that the grille was very nicely created from a narrowed stock ’51 Mercury unit with the wrap around sections removed and replaced with just the end pieces of the wrap around’s. Creating a very nice floating grille bar. And what also was very important was that the photos were taken in late January, or early February 1953, which means that this car had to be created no later than late 1952, and that made it an very early chopped 1951 Mercury. Especially on this side of the US. Overview of the 1953 Detroit Autorama show. Several Alexander Brothers cars were on display at the show as well. Zoomed in we can see how the angled back windshield and lowered top made the car look to have a very long hood. This picture was really great since it showed the beautifully done grille. Sadly the show sign info cannot be read. Overview photo from the other side shows Ron’s Mercury on the top right. 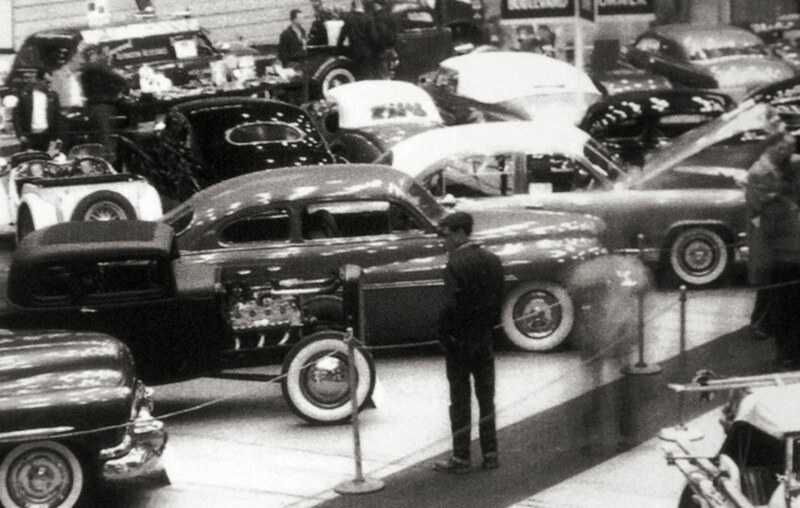 A few more years later I came across an online photo collection of the Ford Motor Company. Photos taken at the 1955 Ford Rotunda Ford Motor Company organized Custom Car and Hot Rod Show. And for the first time I had a name of the owner, Ron Sobran. And by 1955 the car had been updated a bit from the 1953 photos. The most obvious update was a new much darker paint job (now listed as Metallic Maroon), extended rear fenders housing ’54 Mercury taillights, the stock rear bumper was replaced by an 1951 Lincoln unit and stock door handles were replaced by push-buttons, most likely Lincoln units. These 3 new 1955 photos were really fantastic, since they showed a lot more detail than the old ones I had. I now was able to tell that in the chop process the drip rails had been shaved, and the rear of the top/rearwindow had been sunken down. What made the rear of the top really unique was how they had removed the stock bottom stainless trim fro the rear window, and replaced it with an unit that wraps around from the beltline on the sides of the body. I cannot say this is the most attractive way to chop a Mercury, but I like how creative they were with the angled back stock height windshield and rear window solution. Very creative, and especially the continues belt-line chrome trim is very interesting. These new photos also showed the hand made bubble skirts, which look really well with the car, the heavier than stock side trim and the Calnevar wire wheel hubcaps. The last are not rally attractive in my eyes, but they were very popular in the early 1950’s giving your car a more sporty, perhaps even European look. The rear quarter view taken at the audition day shows the skirts really well. 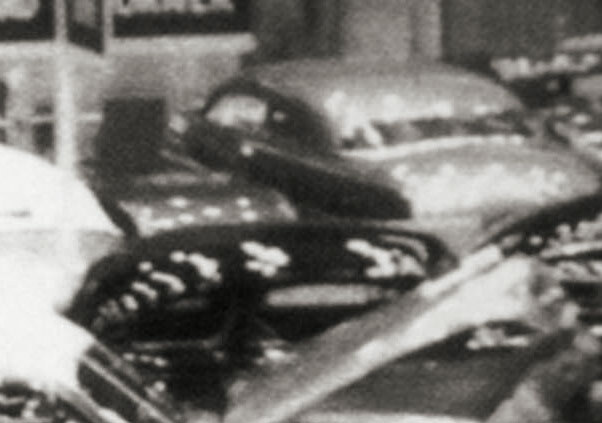 It also shows the sunken or reshaped rear window, the extended rear fender using 1954 mercury rear fenders and taillights, and the addition of an 1951 Lincoln rear bumper. Ron’s Mercury had frenched headlights,most likely stock ’51 Mercury units, the hood was smoothed and the grille opening replaced with a 49-51 unit. The hood corners were not rounded. For the updated version Ron had removed the bumper guards from the Mercury front fenders. 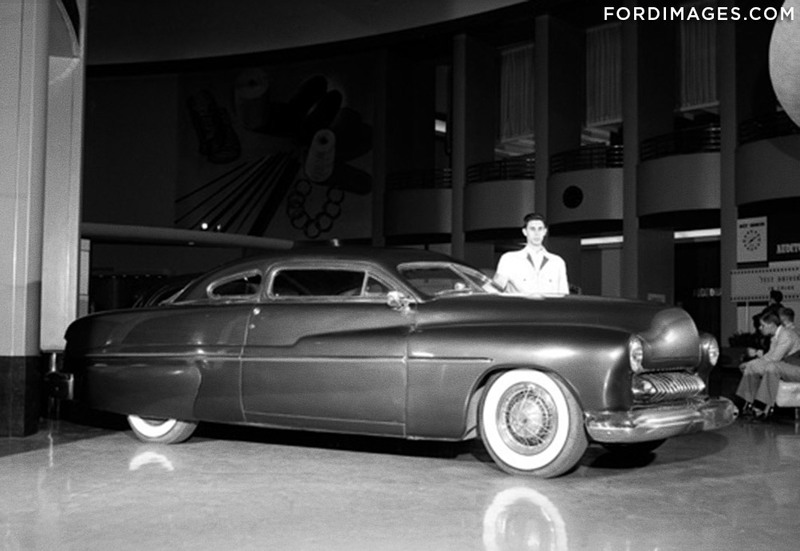 Ron Sobran posing with his Mercury inside the Ford Rotunda Builing Custom Car & Hot Rod show in 1955. This photo shows how much the windshield had to be angled back to get the low side window profile. After I had found out the name of the owner I started asking people about the car and the owner some more. But so far nobody I have asked knew anything about the car, nor the owner. 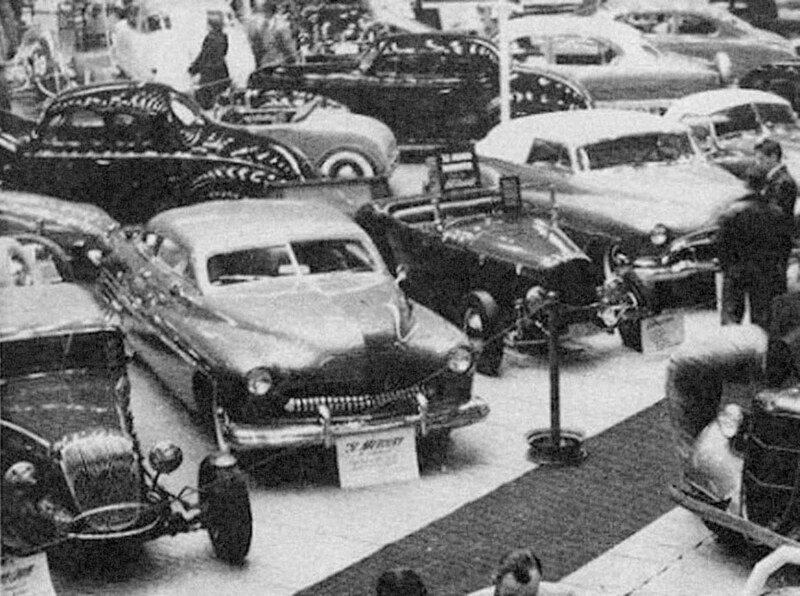 I have not been able to find out who actually build the car, or what happened to it after the 1955 Rotunda Show. These images in this article is all I was aver able to find out. 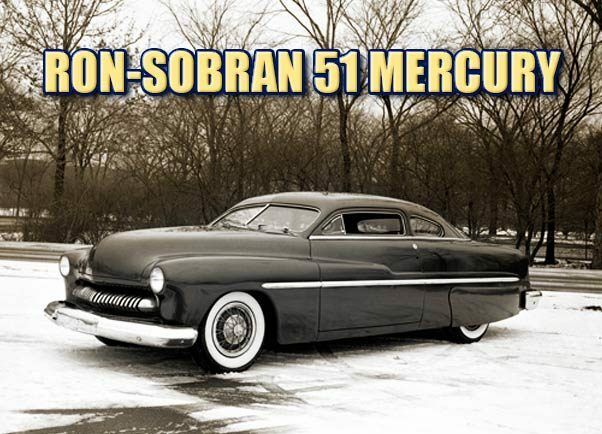 If any of our readers know anything more about Ron Sobran, or his ’51 Mercury, please send us an Email. 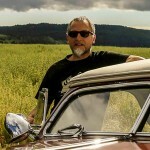 Great Story about a great custom from my home town Rik. Pretty sure chop was done by Clarkaiser. Clarkaiser would make perfect sense. I’m not completely sold on the chop, but I do really like the end pieces on the grille.